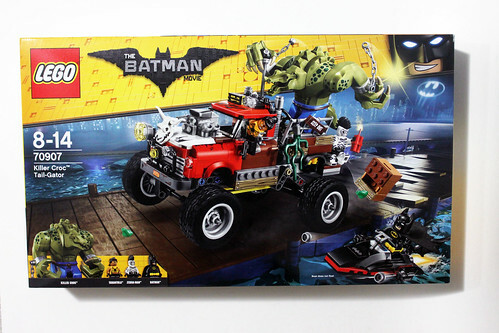 Next up on my reviews of The LEGO Batman Movie sets, I’ll be taking a look at the Killer Croc Tail-Gator (70907). 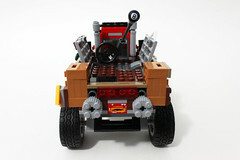 The set has a modest 460 pieces and will retails for a not-so-modest $69.99. 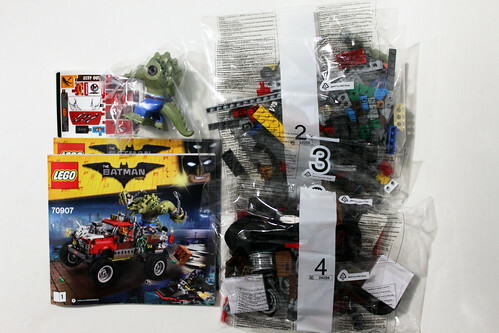 The contents of the box include four numbered bags, two instruction booklets, and a sticker sheet. 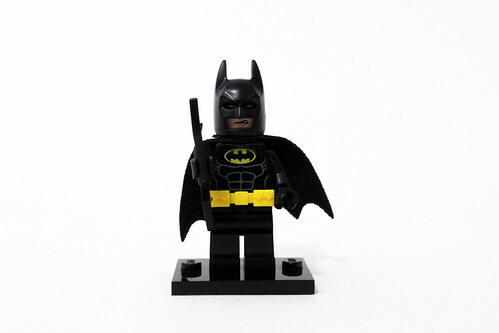 Batman again shows up in another set and again he’s pretty much the same one that we’ve seen before in previous sets. 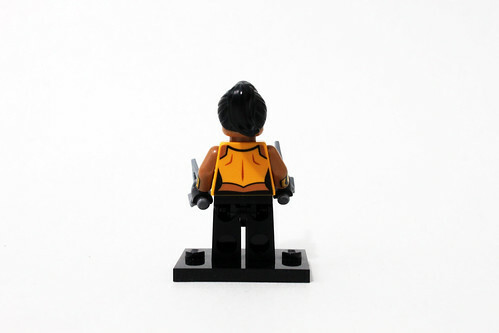 If you haven’t seen my other reviews of TLBM sets, he’s in his usual black outfit, new yellow utility belt, and a double-sided head with a determined and disgusted expressions. 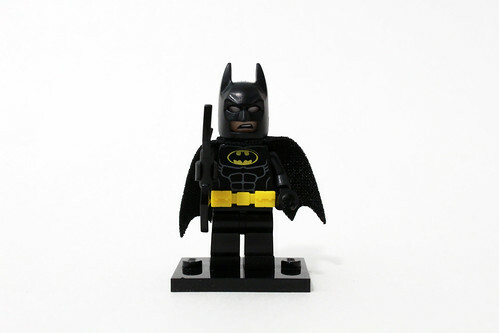 His accessory is a Batarang. 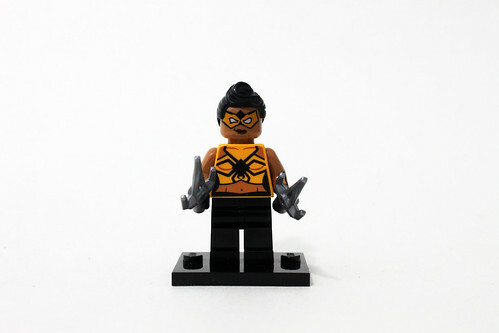 This version of the Tarantula character appears to be the New Earth version of Catalina Flores. The torso is really detailed with a spider logo across the chest. Both of the arm have bracers printing on the wrists. She has a double-sided head with her wearing an orange mask with one expression being a smirking one and an angry look on the other. Her hair piece is a new black version of the hair piece from the Diner Waitress from the Series 11 Collectible Minifigures. Her accessories are a couple of sais. 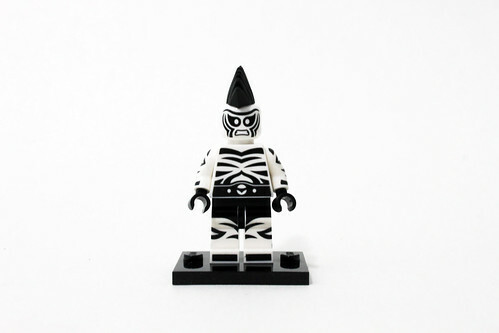 Zebra Man is another obscure character that joins the growing list of lesser-known characters in The LEGO Batman Movie. 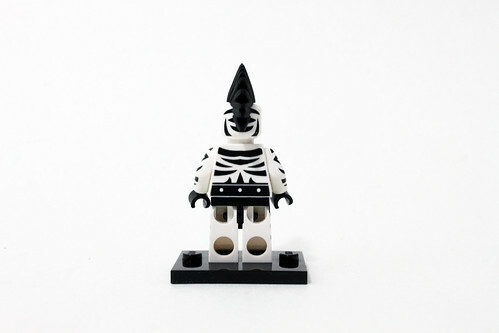 The minifigure is white with lots of black zebra stripes all over the torso and legs. The head has more of the zebra printing on the front and back of the head. To finish off his look, he also has a black mohawk. 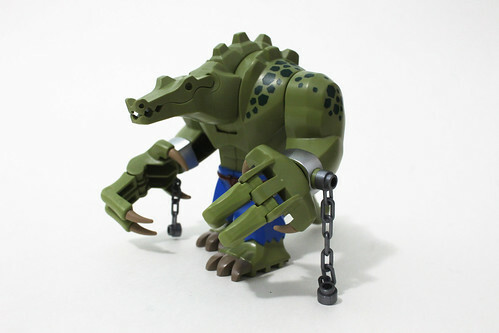 Finally, we have the Kiler Croc bigfig. The mold is basically most of the Killer Croc with the torso, legs, arms, and half of the head. The arms are on click joints which is just a Technic pin with some hinges. The hands can also rotate a full 360 degrees. You do have to attach two of the fingers as well as the all the claws. There are some chain pieces that attach to the wrists. The head is able to look up and down at about a 30 degree angle (I actually calculated that). The top part of Killer Croc’s head uses the old alligator jaw piece and not the newer version of it. The legs and tail do not move at all. He does wear some blue pants with a brown rope for the belt. I will say that quality of the paint job on the belt is a subpar as there is some blue on it. 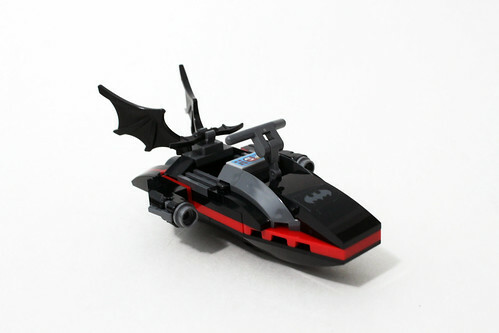 The first part of the build is Batman’s Batski. It has a nicely sleek designed look to it. 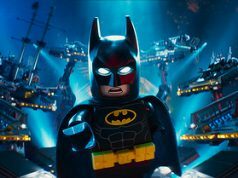 The are a couple of stickers with the Batman symbol in the front and the control panel. On the sides of the Batski, there are a couple of stud shooters to give it some play function. 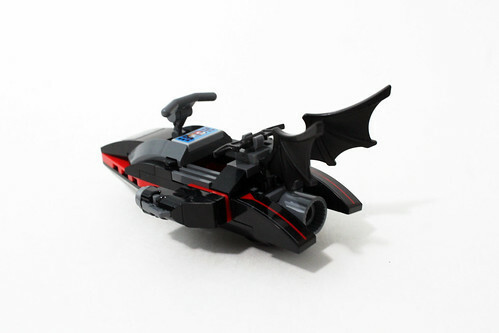 On the top, there’s a place to hold a Batarang. Towards the back, there are a couple of wings to finish off the look. 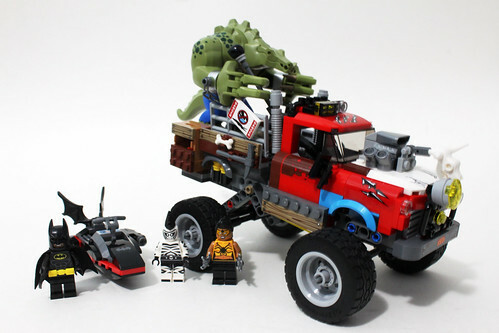 The rest of the parts goes towards Killer Croc’s Tail-Gator. 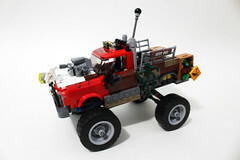 One thing I will say about the vehicle is that it is fairly large. 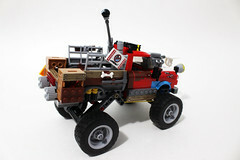 The build is pretty standard and straightforward with not much advanced building techniques. 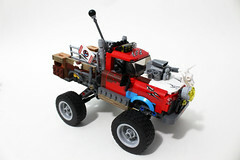 The chassis is supported on a couple of Technic beams and plates. 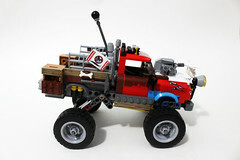 The front of the truck has a lot of detail. The stickered license plate shows it coming from a remote place in Florida. The hood is white so it’s probably a replacement and not part of the original truck. Sitting prominently right above the hood is a large engine, probably a v8. For the hood ornament, there’s a bull skull hood ornament. On the front right part of the grill guard, there’s a large yellow spotlight. In the middle of the truck, the door are starting to brown up especially on the left side where it is mostly brown and has some patchwork on it. 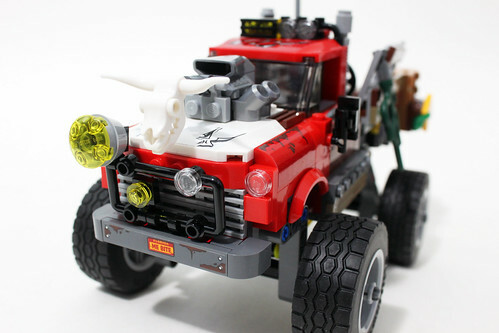 The cabin is able to fit one minifigure in it. 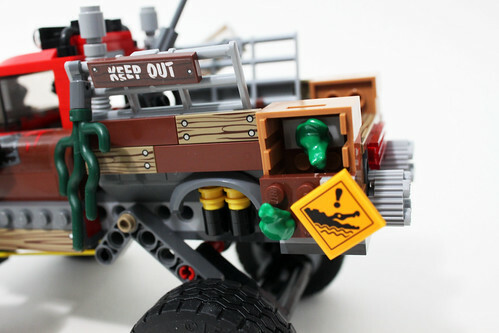 Since Killer Croc won’t fit into the cabin, he has modified the truck to have the steering column on the bed of the truck. 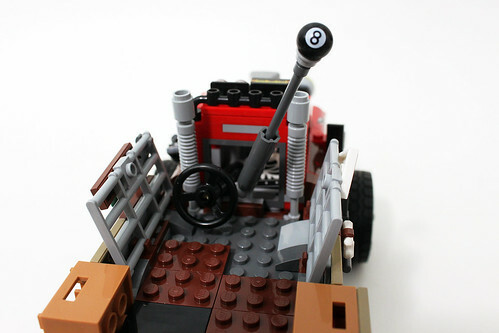 The gear shifter has also been extended which as an black 8-ball knob. On a plus side, the 8-ball is printed so so you can expect some interesting uses of it in MOCs. Towards the back of the truck, there are a couple of crates that are attached to the sides. 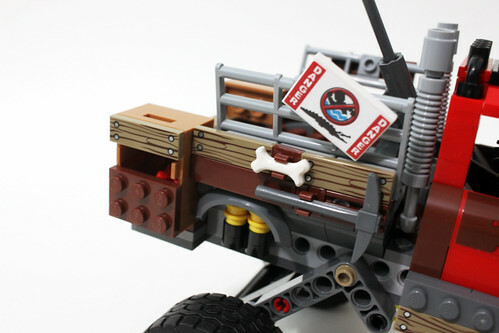 One of the play features of the set is the knobs on the back that you can turn to drop the crate bomb on the right off the side. The left crate just contains a couple of frogs. 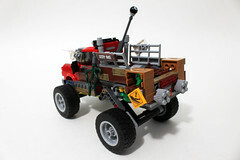 Lastly, I haven’t mentioned the wheels and the suspension. The front wheels are a little smaller than the rear so there’s a slightly lower angle on the front. 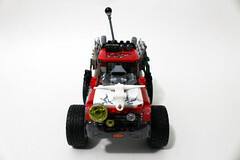 The rear wheels are on a single axle which are connected to the front by some rubberbands. 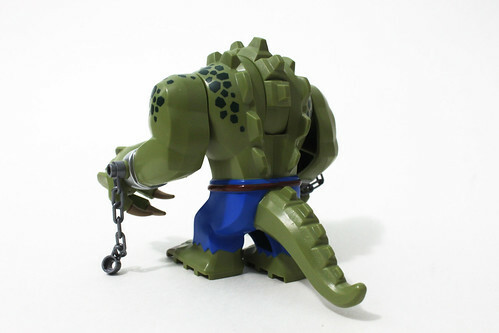 The weight of the Killer Croc bigfig is enough to drop the suspension down. 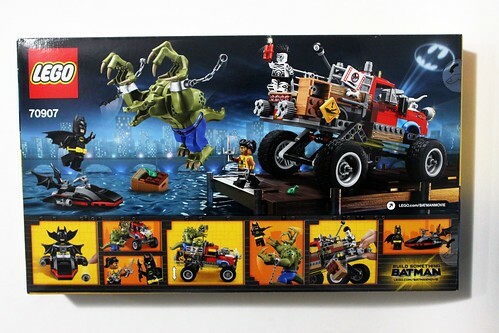 The LEGO Batman Movie Killer Croc Tail-Gator (70907) is a mixed bag for me. 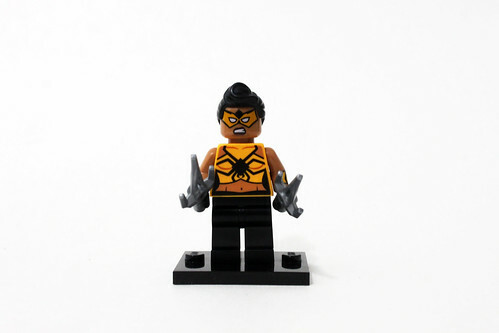 The minifigure selection is great with all of the exclusive ones that we get in this set like Tarantula and Zebra Man. It’s most likely they will stay exclusive to this set as I don’t see them coming in a future set, at least for a while. 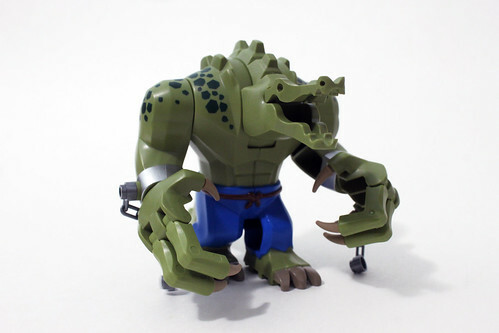 Also, the Killer Croc bigfig is a lot more detailed than the one that we got from the Killer Croc Sewer Smash (76055). 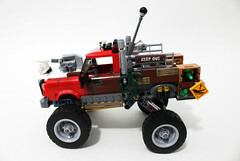 The truck itself seems like your run-of-the-mill vehicle. It’s well made and sturdy but something about doesn’t make it stand out for me. 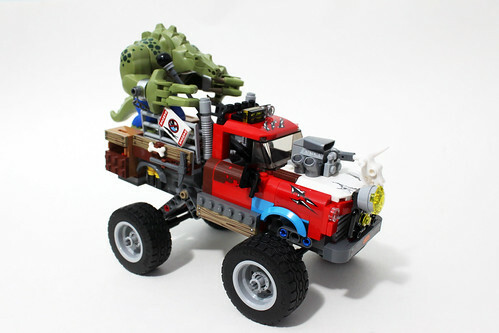 I do like the steering wheel and gear shifter on the bed of the truck but some play features like the crates falling off the sides and the suspension function are pretty subpar considering the fairly premium price of the set.